Welcome to Kagoshima, ladies and gents! This is “mainland” Japan’s southernmost city and our home-away-from-home for the next few days. This hot, humid city of 600,000 souls is very pretty, tucked between green, forested hills and nestled in the shelter of Kinko Bay. As soon as we arrived in Kagoshima today we couldn’t help but notice the thing this town is most famous for, however: the bloody great big volcano just across the bay. This, blog fans, is Sakurajima. 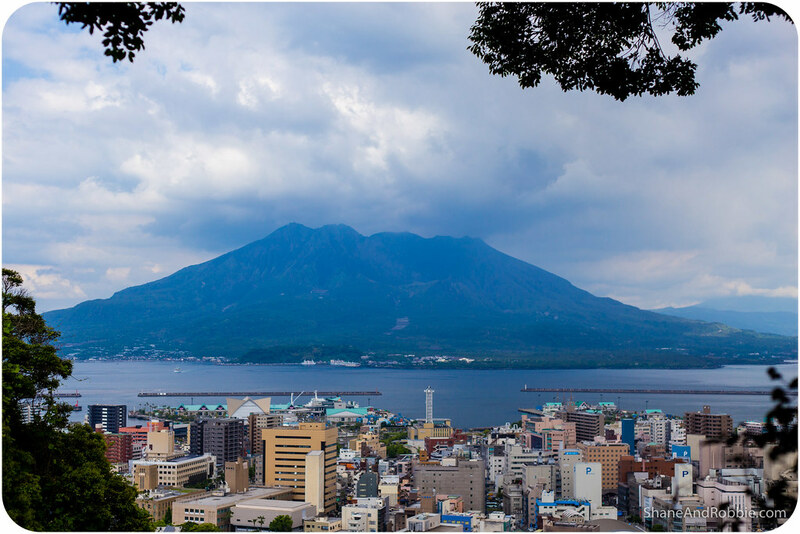 Kagoshima is often compared with its Italian sister city, Naples, due to the climate; the (relatively) hot tempered inhabitants*; and Sakurajima, Kagoshima’s Vesuvius. This 1,117m high mountain is one of Japan’s most active volcanos (seems we can’t get enough of those lately!). The volcano smokes constantly, and the streets here are covered in black ash – it’s piled up in gutters and coats everything. By the end of the day, we were rubbing ash out of our eyes, spitting out bits of black grit, and washing it off our skins. How do the people that live here deal with it?! *What’s “hot tempered” in Japan? Well, let’s just say we’ve heard actual car horns being used here – for actual honking! Sooooo unlike Japan! Sakurajima’s last major eruption was 100 years ago, in 1914; it has been grumbling and belching ash ever since. The Japanese Meteorological & Seismological Bureau keeps a very close eye on this mountain, especially given there are so many people living under its shadow! 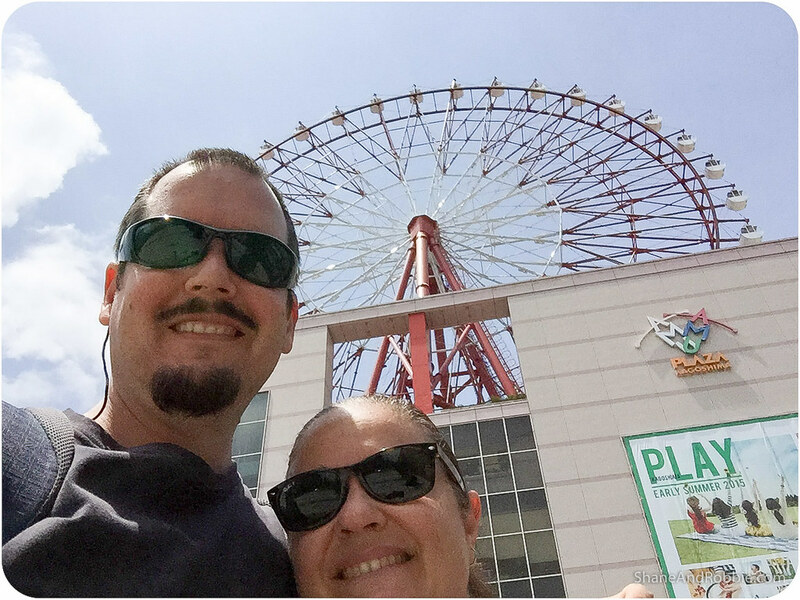 We got in from Kumamoto by shinkansen (love those things) and, after lunch down on the waterfront, spent our afternoon sightseeing. We started up at Shiroyama (i.e. 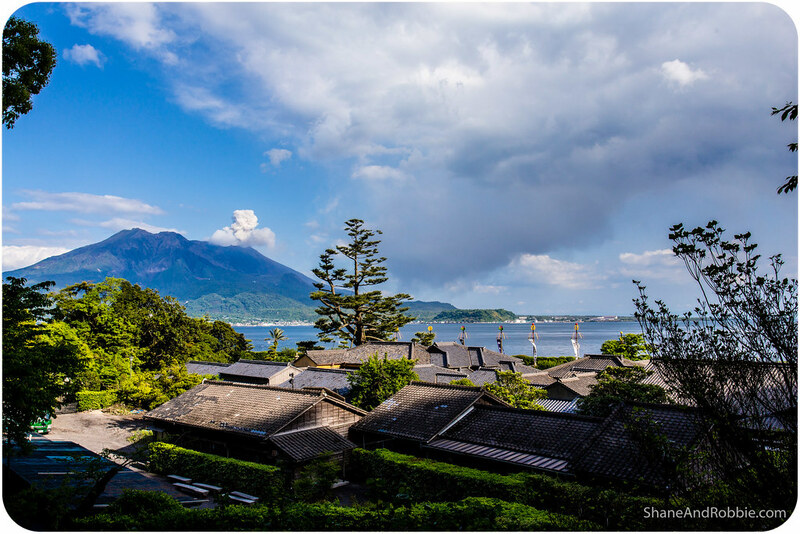 Mt Shiro), the small (non-volcanic) mountain in the centre of town that provides the perfect vantage point from which to enjoy views over Kagoshima, Kinko Bay and, of course, Sakurajima. From there we went to see the local museum, where Kagoshima’s history was laid out. 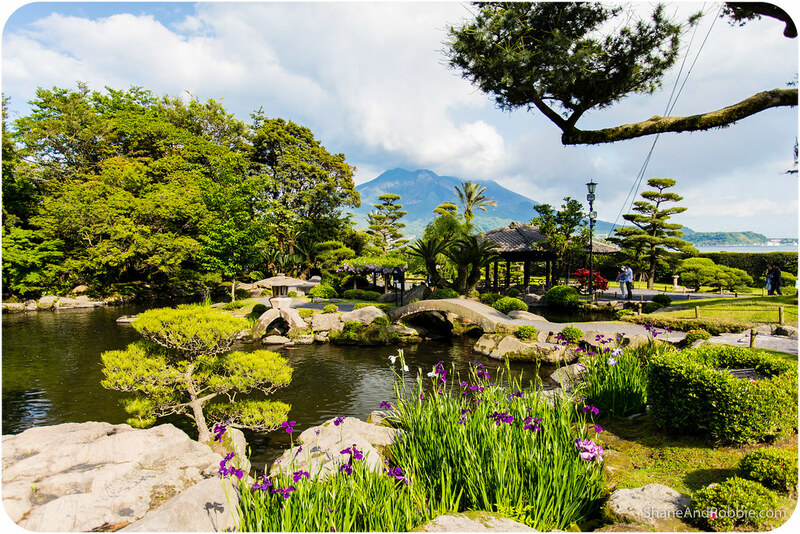 Here we learnt that Kagoshima was a busy commercial port city throughout the Edo Period (i.e. 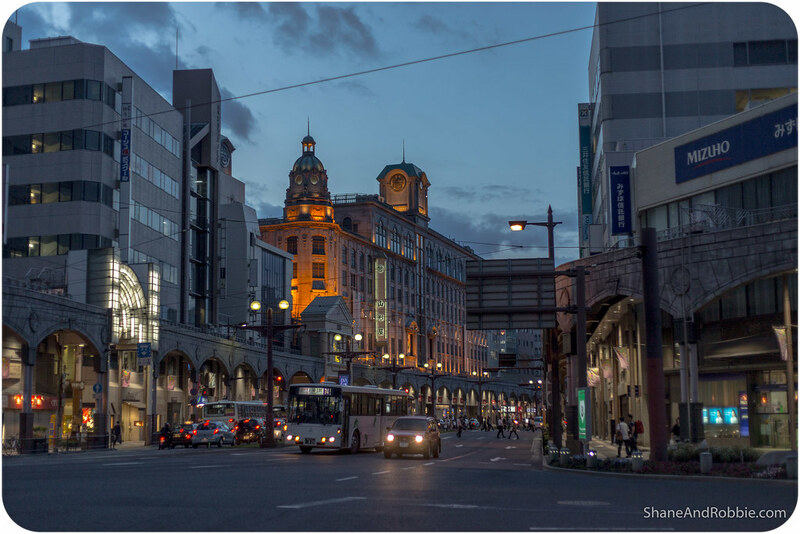 17th and 18th century), and that with the Meiji Restoration, the city also became an important industrial centre. Kagoshima was also the centre for the Satsuma Rebellion in 1877. 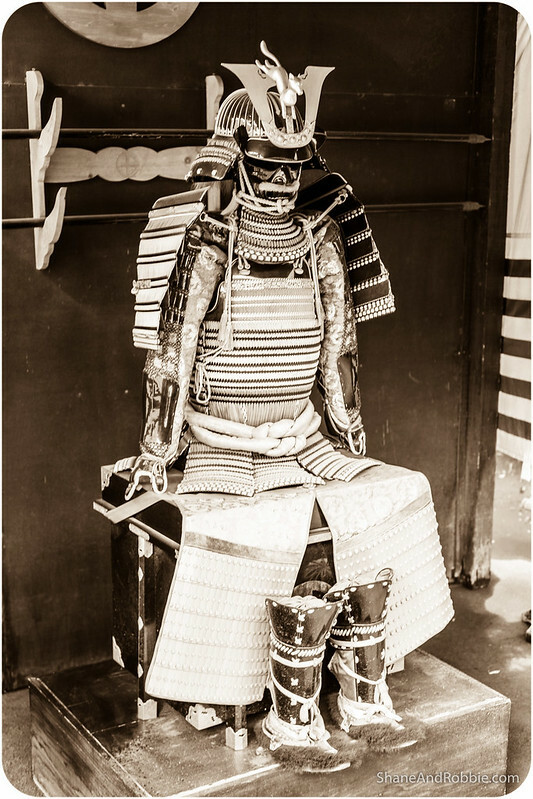 This rebellion was the last stand of “old Japan’s” samurai against the Meiji government and its policies of modernisation and industrialisation. Saigo Takamori, the leader of the rebellion, was born and based here in Kagoshima and is something of a local hero. There are statues of him around town and the museum told his life story in detail. He has been dubbed “the last true samurai”, and the events of his life formed the basis for the 2003 film “The Last Sumurai”. 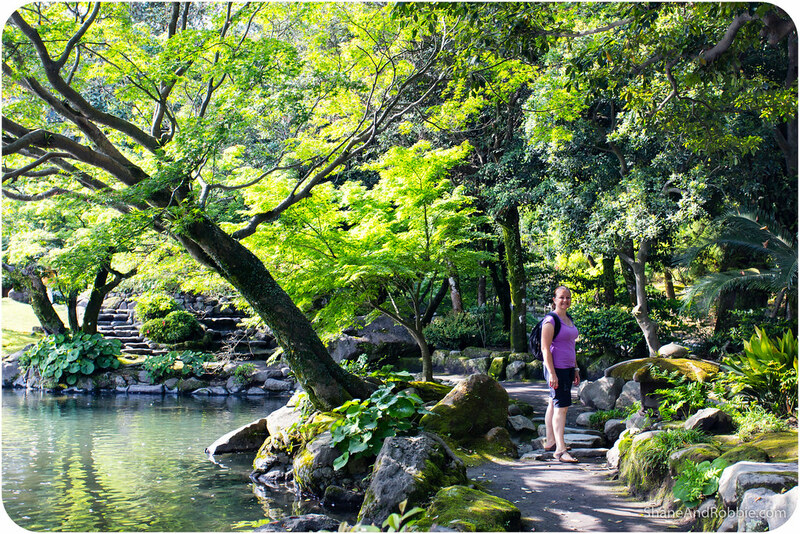 Our final sightseeing spot for the day was the Senganen Garden, just outside of the city. 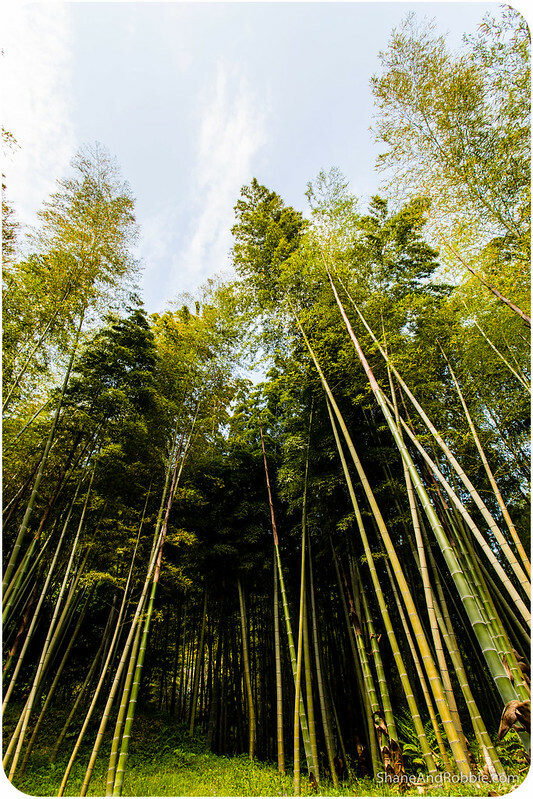 The was originally a private park for the ruling Shimadzu Family and is still maintained by descendants of the family today. 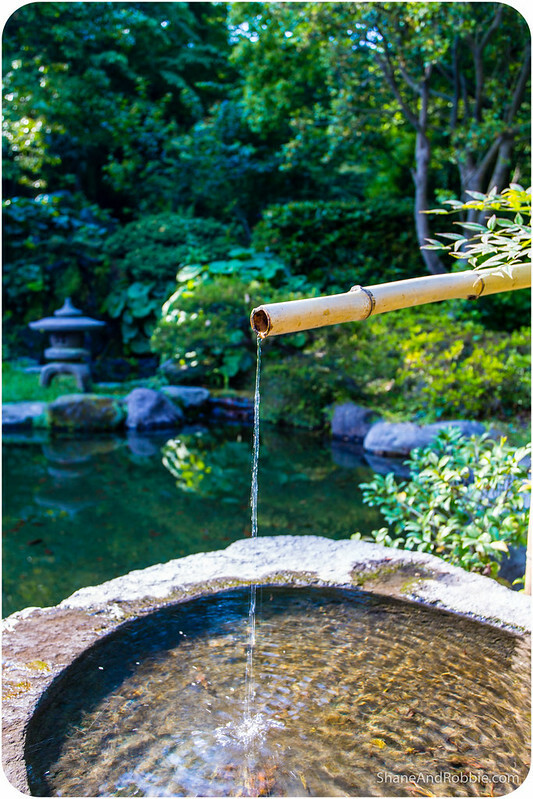 The garden is a beautiful example of Japanese landscaping, and includes small ponds, streams, lots of flowers and a bamboo grove. The Shimazu Clan was one of the most powerful feudal clans during the Edo Period; they ruled this area for almost 700 years. 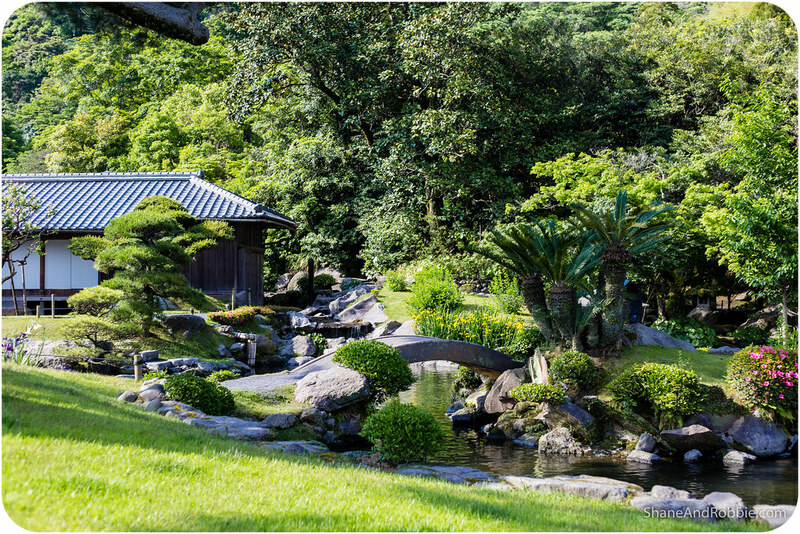 At the center of the garden stands the Shimazu Clan’s original residence. The residence was originally built in 1658 along with the rest of the garden and can be visited with special permission. We stuck to the garden as this is the part that interested us the most and happily enjoyed a couple of hours roaming through the 12-acre grounds. 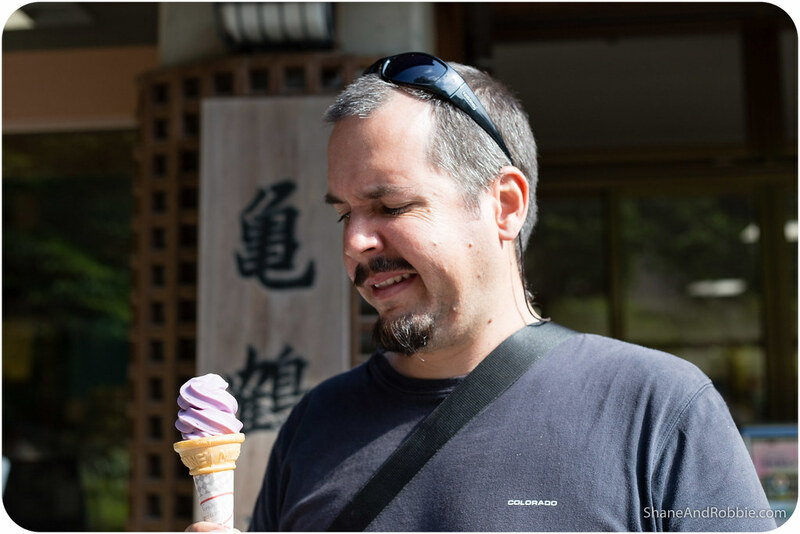 The best part of our visit to Senganeen Gardens, however, was when Shane decided he needed an ice-cream snack. 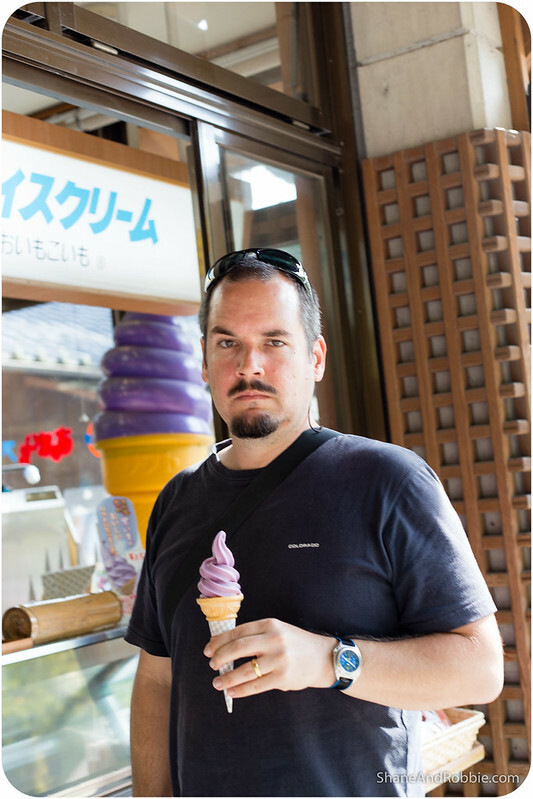 There was stall selling purple-coloured, whipped ice cream. Shane asked what flavour it was an was told it was “yammy”. He took this to mean “yummy” and went ahead and got one. Turns out the lady meant “yammy” as is YAM – i.e. sweet potato. Shane’s facial expressions as he realised he was eating a sweet potato flavoured iced confectionary was awesome! Turns out yams are a local speciality – thanks to rich soil and hot wet climate, sweet potatoes of all kinds thrive here and they grow them by the ton. What to do with all these yams? Why, turn them into cakes, puddings, pastries, chips, snacks, and, of course, ice cream! Following our busy day of sightseeing we went out seeking a good izakaya (i.e. Japanese pub) for sustenance. 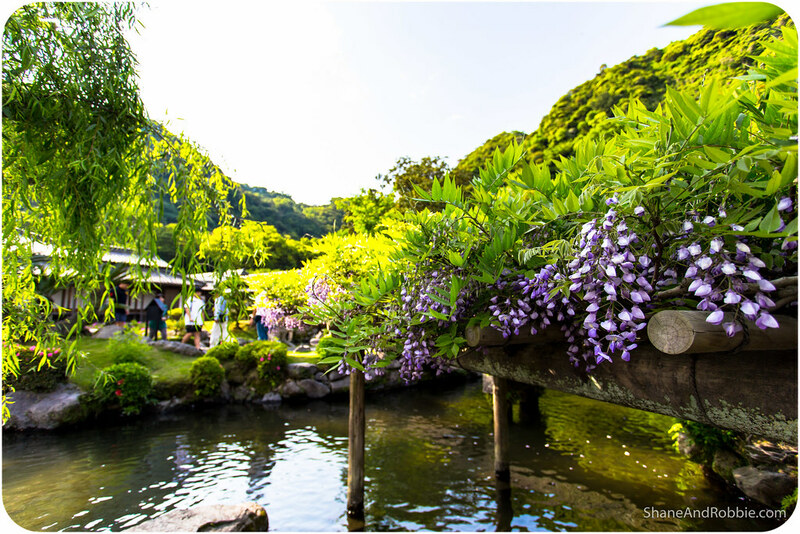 As the sun was setting, the city came alive – this is Golden Week after all! 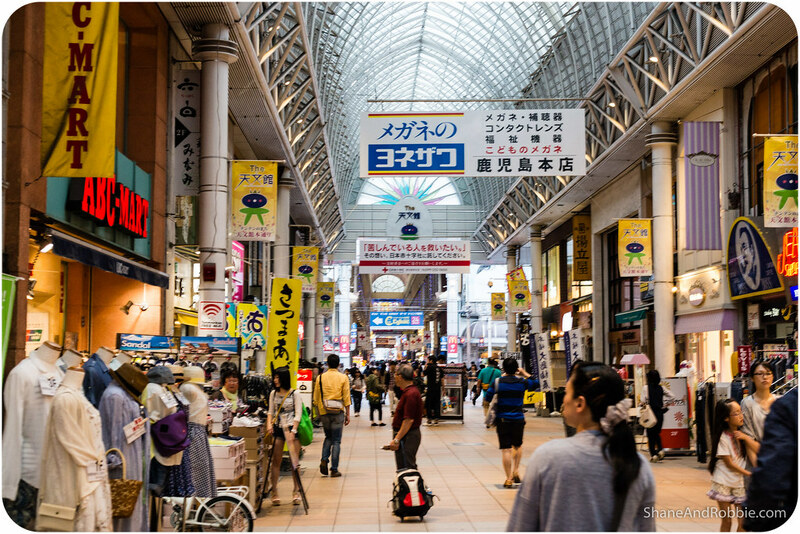 There are kilometres of shopping arcades around here that we walked through on our way to dinner. Mesmerised by all the shiny lights and noisy pachinko parlours, we didn’t see the 2 smiling middle-aged Japanese ladies approaching us until they were right in front of us. They seemed very keen to stop and chat to us in English, which is fine – we’ve had this happen a lot. 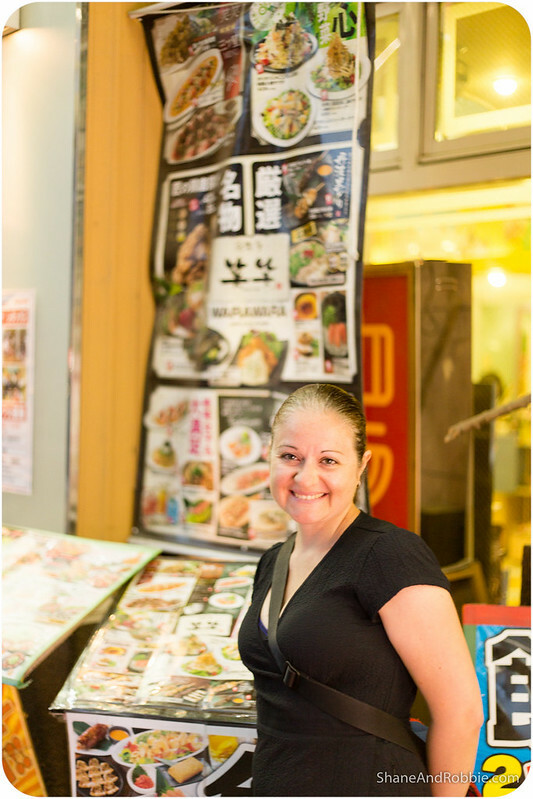 People who learn English here may not get much opportunity to practice, so we’re always happy to stop and chat to random people who approach us wanting to practice their language skills. Luckily we got away pretty quickly and found the dinner we were do desperately searching for not long after. And so, replete and sunburnt, we’re now retreating to bed. Join us tomorrow for more adventures from Southern Japan.